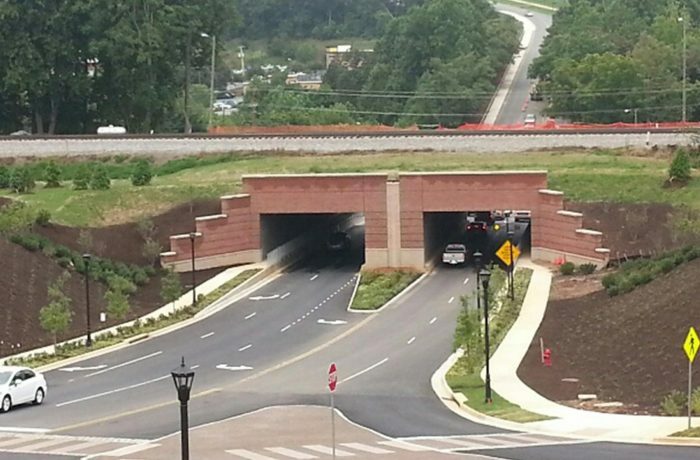 To provide greater connectivity to the busy commercial district next to campus, twin vehicular tunnels were constructed under two mainlines and one-yard track in Lynchburg, Virginia. This project is believed to be the first North American use of the jacked box construction method in which the box was pulled, instead of pushed. Featured in Engineering News-Record, this project was awarded both Best Safety Project and Best Small Project in 2014 by ENR MidAtlantic. The firm’s President, Leonard Fletcher, PE, PLS served as project manager and our team maintained assurances of railroad track stability during jacking of the tunnels under a fully operating rail service.